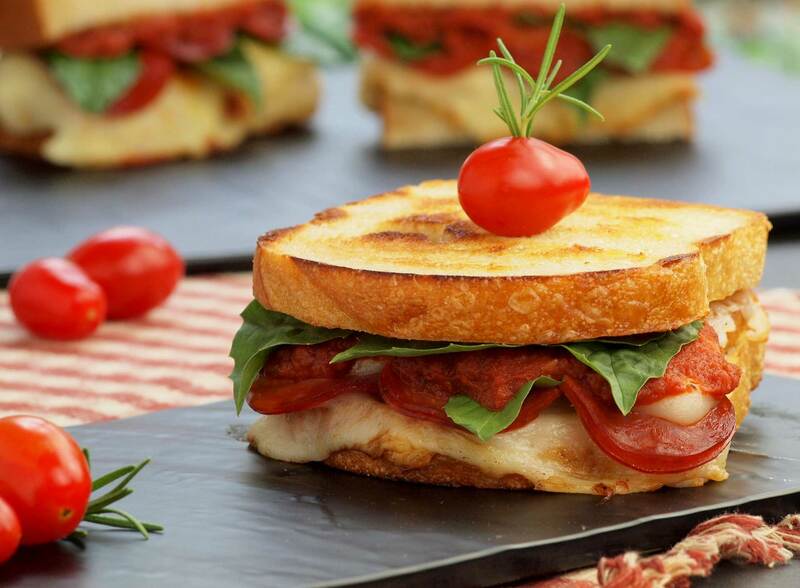 Kids and parents alike will love this melty pairing of a mozzarella grilled cheese sandwich loaded with their favorite pizza toppings. It’s guaranteed to be everyone’s favorite quick meal! Mix Whole Milk Ricotta Cheese and marinara sauce in a small saucepot heating gently on low until ready to assemble and serve. Butter both sides of each bread slice and lightly sprinkle with garlic powder. Place the slices in large skillet or on a griddle set to medium-low heat. Cook in batches if necessary. Cook 3 to 4 minutes or until bread is browned on one side. Flip half of the slices of bread and spread with 1 – 2 tablespoons of ricotta sauce, slices of Fresh Mozzarella Cheese, and a tablespoon of mini pepperoni slices. Add additional pizza toppings if desire. Top with remaining slices of bread toasted side down. Flip sandwich and continue to cook on medium-low heat until the bottom slice of bread is toasted. Flip and cook sandwiches until cheese is melted. If cooking in small batches, hold finished sandwiches on a sheet tray in an oven set at 300°F. When serving, cut sandwiches in half and enjoy with marinara sauce for dipping.